The enthralling and evocative story of tough Depression-era bandits who vowed to make something of themselves, even if that meant defying the stone walls of America’s most infamous prison, by a writer who grew up in Sing Sing’s shadow. During an era of never-ending breadlines and corrupt cops, no place churned out budding crooks more efficiently than Hell’s Kitchen. Neighborhood loyalties bonded gangs of immigrant sons who were looking for a way out of 1930s New York, and waterfront kids like Whitey Riordan paid the bills with small-time hustling. But when enterprising crook Patches Waters invited Whitey into the Shopping Bag Gang, Whitey jumped at the big score. Bold black headlines announced the group’s string of successful heists, but the gravy train abruptly halted in 1939 when someone squealed and police captured most of the gang. Patches and Whitey were sent up the river to Sing Sing. Westside connections couldn’t help much there, in the infamous Hudson River prison that had housed convicts for more than a century. In Sing Sing the boys had to answer to veteran warden Lewis Lawes, a revolutionary reformer who preferred trust and rehabilitation to old standbys like the lash and the yoke. Progressive indeed, but nothing changed the fact that Whitey and Patches, along with more than 2,800 other men, faced a future of endless days in a cage of limestone, cement, and steel. Perhaps inevitably, their thoughts turned to escape. A string of well-publicized jailhouse riots and breakouts captured the country’s interest in the 1930s, and though prisons kept stepping up security, convicts continued to crash out. When Patches encountered an old cellblock crony who had stumbled upon a way out, he pieced together a daring escape plot involving purloined guns, counterfeit keys, precision timing, a complex network of outside accomplices, and the kind of outsize bravado that would have made Dillinger proud. Unable to resist the thought of freedom, Whitey signed on. On Easter Sunday 1941, the three embarked upon the most sensational breakout in the prison’s history. Leaving four men dead and indelibly staining the reputation of the nation’s most famous warden, the Westside boys transcended their wildest dreams, only to find themselves backed to the edge of a wide, dark river. Meticulously researched and beautifully written,Crash Outis a gritty, page-turning saga that reveals how the career of one resilient hustler can illuminate a sliver of Americana. 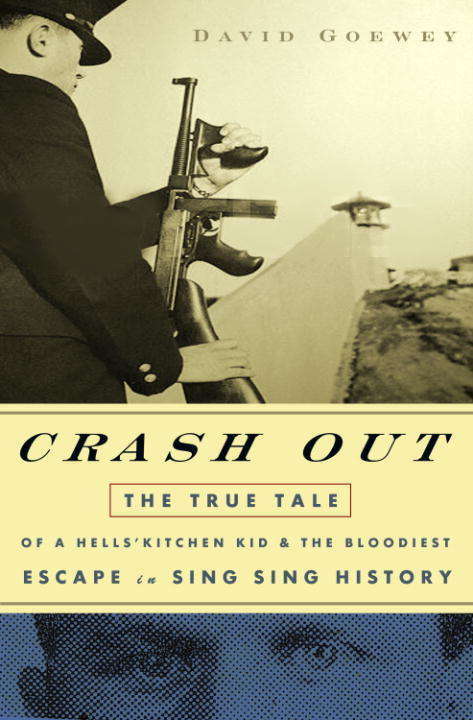 A riveting account of the boldest escape in Sing Sing history and the gangster culture that birthed the defiant bandits,Crash Outis a gripping historical epic set against the fascinating backdrop of Depression-era New York. From the Hardcover edition.